Please plan to drop off and/or shop without small children if at all possible. We run specials, giveaways and promotions for our Facebook fans! It's a great way to get up-to-the-minute information about our events. So go ahead and like us! We like you, too! You can also find us on Instagram @JBFSaleUtah You'll find lots of great pics of the events and behind the scenes happenings. Hangers: While some sales require a specific type of hanger (usually wire) for clothing, we are happy to accept clothing on any type of hanger you'd like to use as long as the clothes fit on it nicely. 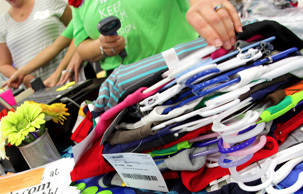 Price Minimums: We do not currently have a required minimum price for hanging clothing. Although, we do recommend pricing at about $3 and up to justify the time/effort you'll spend preparing and tagging the item. If something's not quite worth $3, try making an outfit or set to bring the price up. Admission: Right now, the Utah events are FREE ADMISSION on Friday & Saturday. You may also attend our Prime Time Shopping event on Thursday evening 5pm-8pm with $5 admission.